Stephen Edward Ambrose (January 10, 1936 – October 13, 2002) was an American historian and biographer of U.S. Presidents Dwight D. Eisenhower and Richard Nixon. He was a longtime professor of history at the University of New Orleans and the author of many best selling volumes of American popular history. Beginning late in his life and continuing after his death, however, evidence and reports have continued to surface documenting longtime patterns of plagiarism and inaccuracies in many of his published writings and other work. In response to one of the early reports, Ambrose said he was not "out there stealing other people's writings." In the wake of his death, a reviewer for the New York Times did not absolve him completely, but opined that "he certainly deserved better from some of his envious peers" and credited the historian with reaching "an important lay audience without endorsing its every prejudice or sacrificing the profession's standards of scholarship." Ambrose was born in Lovington, Illinois to Rosepha Trippe Ambrose and Stephen Hedges Ambrose. His father was a physician who served in the U.S. Navy during World War II. Ambrose was raised in Whitewater, Wisconsin, where he graduated from Whitewater High School. His family also owned a farm in Lovington, Illinois and vacation property in Marinette County, Wisconsin. He attended college at the University of Wisconsin-Madison where he was a member of Chi Psi Fraternity and played on the University of Wisconsin football team for three years. Ambrose was a history professor from 1960 until his retirement in 1995, having spent the bulk of his time at the University of New Orleans, where he was named the Boyd Professor of History in 1989, an honor given only to faculty who attain "national or international distinction for outstanding teaching, research, or other creative achievement". During the academic year 1969-70, he was Ernest J. King Professor of Maritime History at the Naval War College. In 1970, while teaching at Kansas State University, Ambrose participated in heckling of Richard Nixon during a speech the president gave on the KSU campus. Given pressure from the KSU administration and having job offers elsewhere, upon finishing out the year Ambrose offered to leave and the offer was accepted. His opposition to the Vietnam War stood in contrast to his research on "presidents and the military at a time when such topics were increasingly regarded by his colleagues as old fashioned and conservative." Ambrose also taught at Louisiana State University, Johns Hopkins University, Rutgers University, U.C. Berkeley, and a number of European schools, including University College Dublin, where he taught as the Mary Ball Washington Professor of American History. In 1964 Ambrose was commissioned to write the official biography of the former president and five-star general Dwight D. Eisenhower. This resulted in a book on Eisenhower's war years, The Supreme Commander (1970) and a two-volume full biography (published 1983 and 1984), which are considered "the standard" on the subject. Regarding the first volume, Gordon Harrison, writing for the New York Times, proclaimed, "It is Mr. Ambrose's special triumph that he has been able to fight through the memoranda, the directive, plans, reports, and official self-serving pieties of the World War II establishment to uncover the idiosyncratic people at its center. Ambrose also wrote a three-volume biography of Richard Nixon. Although Ambrose was a strong critic of Nixon, the biography is considered fair and just regarding Nixon's presidency. A visit to a reunion of Easy Company veterans in 1988 prompted Ambrose to collect their stories, turning them into Band of Brothers, E Company, 506th Regiment, 101st Airborne: From Normandy to Hitler's Eagle's Nest. (1992) D-Day (1994), built upon additional oral histories, presented the battle from the view points of individual soldiers and became his first best seller. A reviewer for the Journal of Military History commended D-Day as the "most comprehensive discussion" of the sea, air, and land operations that coalesced on that day. Christopher Lehmann-Haupt, writing for the New York Times, proclaimed that "Reading this history, you can understand why for so many of its participants, despite all the death surrounding them, life revealed itself in that moment at that place." Ambrose's Citizen Soldiers, which describes battles fought in northwest Europe from D-Day through the end of the war, utilized, again, extensive oral histories. Citizen Soldiers became a best seller, appearing on the New York Times best sellers lists for both hardcover and paperback editions in the same week. During the same week, in September 1998, D-Day and Undaunted Courage, Ambrose's 1996 book on Meriwether Lewis and the Corps of Discovery, appeared on the best seller list, also. He also wrote The Victors (1998), a distillation of material from other books detailing Eisenhower's wartime experiences and connections to the common soldier, and The Wild Blue, that looks at World War II aviation largely through the experiences of George McGovern, who commanded a B-24 crew that flew numerous missions over Germany. His other major works include Undaunted Courage about the Lewis and Clark Expedition and Nothing Like It in the World about the construction of the Pacific Railroad. His final book, This Vast Land, a historical novel about the Lewis & Clark expedition written for young readers, was published posthumously in 2003. Ambrose appeared in the 1973-74 ITV television series, The World at War, which detailed the history of World War II. In addition to his academic work and publishing, Ambrose operated a historical tour business, acting as a tour guide to European locales of World War II. Also, he served on the board of directors for American Rivers and was a member of the Lewis and Clerk Bicentennial Council. Ambrose's work for the Eisenhower Center, specifically his work with D-Day veterans, inspired him to found the National D-Day Museum in New Orleans. Ambrose initiated fundraising by donating $500,000. "He dreamt of a museum that reflected his deep regard for our nation's citizen soldiers, the workers on the Home Front and the sacrifices and hardships they endured to achieve victory. He secured large contributions from the federal government, state of Louisiana, Tom Hanks, Steven Spielberg, and many smaller donations from former students, who answered a plea made by Ambrose in the New Orleans Times-Picayune. In 2003, Congress designated the museum as "America's National World War II Museum," acknowledging an expanded scope and mission for the museum. "The Stephen E. Ambrose Memorial Fund continues to support the development of the museum's Center for Study of the American Spirit, its educational programs and oral history and publication initiatives." In 1997, Ambrose received the St. Louis Literary Award from the Saint Louis University Library Associates. In 1998, he received the National Humanities Medal. In 2000, Ambrose received the Department of Defense Medal for Distinguished Public Service, the highest honorary award the Department of Defense offers to civilians. In 2001, he was awarded the Theodore Roosevelt Medal for Distinguished Service from the Theodore Roosevelt Association. Ambrose won an Emmy as one of the producers for the mini-series Band of Brothers. Ambrose also received the George Marshall Award, the Abraham Lincoln Literary Award, the Bob Hope Award from the Congressional Medal of Honor Society, and the Will Rogers Memorial Award. Many survivors of D-Day have put Ambrose's accounts as 'fiction'. A front page article published in The Sacramento Bee on January 1, 2001, entitled "Area Historians Rail Against Inaccuracies in Book", listed more than sixty instances identified as "significant errors, misstatements, and made-up quotes" in Nothing Like It in the World: The Men Who Built the Transcontinental Railroad, 1863–1869, Ambrose's non-academic popular history about the construction of the Pacific Railroad between Council Bluffs, Iowa/Omaha, Nebraska and the San Francisco Bay at Alameda/Oakland via Sacramento, California, which was published in August, 2000. The discrepancies were documented in a detailed "fact-checking" paper compiled in December, 2000 by three Western US railroad historians who are also experienced researchers, consultants, and collectors specializing in the Pacific Railroad and related topics. ↑ "Biography and Video Interview of Stephen Ambrose at Academy of Achievement". Achievement.org. Retrieved 2012-07-30. 1 2 3 Richard Goldstein, "Stephen Ambrose, Historian Who Fueled New Interest in World War II, Dies at 66," New York Times, October 14, 2002, accessed May 27, 2010. ↑ Neil H. Shively (September 19, 1996). "A Class Act: Stephen Ambrose's History Lectures Enthrall Kids and War Veterans Alike.". The Capital Times, Madison, WI. ↑ Ambrose, Stephen E. Comrades: Brothers, Fathers, Heroes, Sons, Pals. Simon & Schuster, 2000, p. 132. ↑ Historian Stephen Ambrose dies CNN, October 14, 2002. 1 2 3 4 Stephen E. Ambrose bio by Stephen Ambrose. 1 2 Christian A. Hale, "Stephen Ambrose Dies," Perspectives, December, 2002. 1 2 Interview with Stephen Ambrose May 22, 1998, Academy of Achievement, Washington, D.C.
↑ Alan Brinkley, "The Best Man", New York Times Review of Books, July 16, 1987. ↑ "Eisenhower Center - University of New Orleans". Retrieved 6 October 2016. 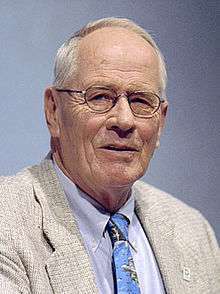 1 2 3 M. R. D. Foote, "Stephen Ambrose: Historian and author of Band of Brothers," The Independent, October 14, 2002, accessed May 27, 2010. ↑ Art Jester. Ambrose Installs New Faith in Some Old Heroes. Lexington Herald-Leader. November 9, 1997. ↑ Gwendolyn Thompkins. Ambrose to Leave Historic Legacy: UNO Prof in Colin Powell's Camp. Times-Picayune. April 30, 1995. ↑ Stephen E. Ambrose, "Refighting the Last Battle: The Pitfalls of Popular History," by Stephen E. Ambrose, Wisconsin Magazine of History, vol. 49, no. 4 (Summer 1966), pp. 294-301. 1 2 3 Timothy D. Rives, "Ambrose and Eisenhower: A View from the Stacks in Abilene," History News Network, May 17, 2010. ↑ Jim Newton, "Books & Ideas: Stephen Ambrose's troubling Eisenhower record," Los Angeles Times, May 9, 2010, accessed May 26, 2010. "His work on Eisenhower is penetrating and readable, lively, balanced and insightful. Indeed, these efforts have long stood alongside Fred Greenstein's The Hidden-Hand Presidency as the standards against which other Eisenhower scholarship is judged." ↑ Neuhaus, Richard J. "Nixon: The Education of a Politician 1913-1962, by Stephen E. Ambrose" (book review), Commentary Magazine, August 1987. "Nixon is competently, sometimes brightly, written, and one gets the impression that Ambrose is striving, above all, to be assiduously fair." ↑ "Best Seller," New York Times Book Review, September 20, 1998, p. BR38 and BR40. ↑ "List of essays by Stephen Ambrose". Retrieved 14 January 2014. 1 2 Nicholas Confessore, "Selling Private Ryan," The American Prospect, September 24-October 8, 2001, p. 21-27. 1 2 3 4 5 6 7 8 Historian Steven Ambrose Dead at 66, National Geographic News, October 15, 2002. ↑ Ebert, Roger. "Tom Hanks recalls 'Private Ryan' shoot - Interviews - Roger Ebert". Retrieved 6 October 2016. 1 2 "Stephen Ambrose". Retrieved 6 October 2016. 1 2 3 Rayner, Richard (April 26, 2010). "Channelling Ike". The New Yorker. Retrieved 2010-05-11. ↑ "Stephen E. Ambrose - Bookreporter.com". Retrieved 6 October 2016. 1 2 "About The Founder - The National WWII Museum - New Orleans". Retrieved 6 October 2016. ↑ "Saint Louis Literary Award - Saint Louis University". Retrieved 6 October 2016. ↑ Theodore Roosevelt Association, The Theodore Roosevelt Distinguished Service Medal Recipients. ↑ Tribute to Stephen E. Ambrose, capitolwords.org, October 16, 2002 words.org/date/2002/10/16/luker#ixzz2uTBVBwBF. Retrieved February 25, 2014. ↑ "Stephen E. Ambrose, Ph.D.". Academy of Achievement. Retrieved August 12, 2011. ↑ "Endowed Chairs and Professors - University of New Orleans". Retrieved 6 October 2016. 1 2 3 David D. Kirkpatrick, "As Historian's Fame Grows, So Does Attention to Sources," New York Times, January 11, 2002, accessed May 27, 2010. ↑ Writing History PBS News Hour discussion of plagiarism by historians, January 28, 2002. 1 2 3 "How the Ambrose Story Developed," History News Network, June 2002. ↑ Mark Lewis, "Ambrose Problems Date Back To Ph.D. Thesis," Forbes, May 10, 2002. ↑ "BBC - WW2 People's War - The Royal Navy on Omaha Beach". Retrieved 6 October 2016. ↑ Stobridge E. (2002). Stephen Ambrose: Off the Rails. History News Network. ↑ Walter Nugent, Review: Nothing Like It in the World: The Men Who Built the Transcontinental Railroad, 1863-1869 by Stephen E. Ambrose, The Journal of American History, vol. 88, no. 2 (Sep. 2001), p. 657. ↑ Don L. Hofsommer, untitled review, Technology and Culture, vol. 43, no. 1 (Jan. 2002), pp. 169-170. ↑ Goldman, Russell (April 27, 2010). "Did Historian Stephen Ambrose Lie About Interviews with President Dwight D. Eisenhower?". ABC News. Retrieved 2010-05-11. ↑ Rayner, Richard. "Uncovering Stephen Ambrose's fake Eisenhower interviews". The New Yorker. Retrieved 2012-07-30.